Never let it be said that Stripped Screw is inflexible. In their brazen history (so far) are roughly half a dozen lineup changes, scads of intriguing themes (What to Wear to the Apocalypse, anyone? ), a helping of atypical narratives mixed with multiple road shows, guests, venues, and side projects… and a few hefty surprises. But we’ll get to that in a moment. What’s most important is that in that Stripped Screw circa 2012 has some might lofty aspirations, and they’re edging a little outside their own safety net with every show. In other words, under the sharp eye of Violet Tendencies and her well-chosen company, Stripped Screw (and Violet’s own Valkyrie Productions) is making impressive strides forward in the densely populated burlesque city of Seattle. 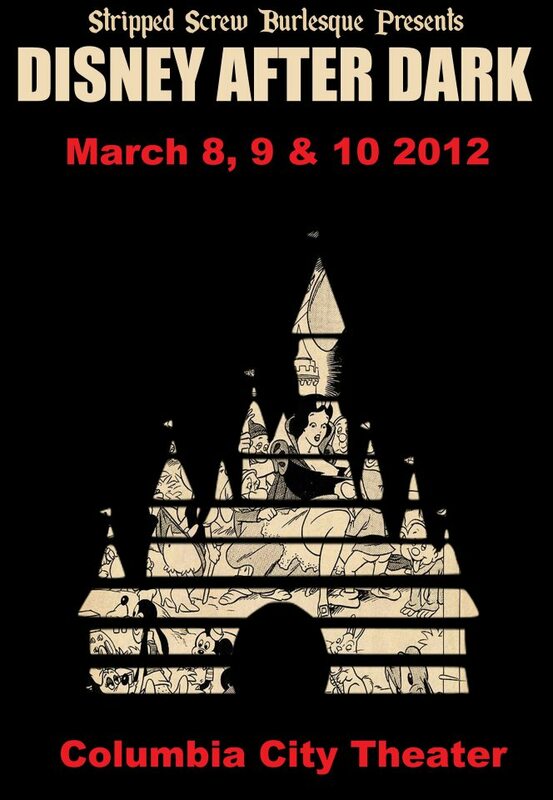 Stripped Screw’s successful Disney After Dark show (which toured regionally in Portland and Olympia) returns for three nights March 8-10. The shows will take place at the beautiful Columbia City Theater, which was built in 1917 and is the oldest vaudeville theater in the state of Washington. The cast includes all of Stripped Screw Burlesque: Violet Tendencies, Stella D’Letto, Kylie Koyote, Kutie La Bootie…plus auxiliary Screw Roxie Moxie, returning from Texas especially for Disney After Dark. Other guests include Prince(ss) Longfellow, Paris Original, Trojan Original, Bella Bijoux, Iva Handfull and Tin Pan Sally. As for that big announcement… in addition to featuring Baby Le’Strange from Rose City Shimmy (Portland) and Evilyn Sin Claire of Sinner Saint, Stripped Screw has confirmed a big, beautiful star will guest in Disney After Dark: the one and only Tigger, all the way from New York City. Tigger started stripteasing in 1992 and was one of the first performers in New York’s burlesque revival. There weren’t many men performing under the banner of “burlesque” at that time; years later Tigger met up with other pioneering male performers like San Francisco’s Roky Roulette and Baltimore’s Evil Hate Monkey. Over the years, Tigger became an accidental mentor and teacher to a new generation of burlesque and boylesquers. He is a cherished performer in the world of modern burlesque. ~ by angrytruffle on 02/01/2012.